Knowing how to tie a bow is an essential skill for anyone who enjoys wrapping presents, decorating for parties, and celebrating the holidays. Here are three easy ways on how to make a bow with wired ribbon. With the holiday season fast approaching, perhaps you can learn how to tie a bow during your spare time. It's fun to do, especially with your friends during the weekends! So in this post, we'll teach you not one, not two, but three ways on how you can tie a bow. 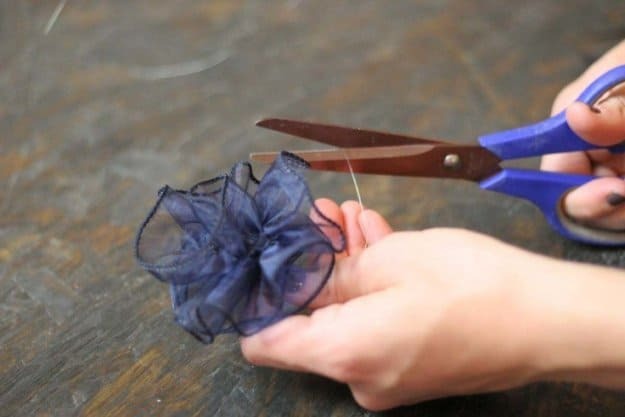 To make a large circular bow, you will need three things: a wide ribbon, a thinner ribbon, and your scissors. Cut out about 1.5 yards of the wide ribbon and about a foot of the thin ribbon. Begin with your wide ribbon. Place it on the table and start folding over 5″ pieces on top of each other, accordion-style. Fold over the entire length of the wide ribbon. It should stack neatly on top of itself. Once you have your entire ribbon folded accordion-style over itself, clip the sides of your ribbon. Clip out a V, making sure to catch all the layers of ribbon when you clip. Take your thin piece of ribbon and place it under the V-notched sides. Tie your thin ribbon in a basic overhand knot around the wide ribbon, pull it tight. Take some time to pull all the pieces of wire ribbon apart, puff them out to give them volume. I used a wire ribbon to add more body, but any kind of ribbon will still work. Wasn't that easy? Now you are a bow expert, and all of your packages can now have a lovely personal charm. Keep reading for two more easy bow tutorials! You can use any type of ribbon for this bow. You will need approximately one yard of ribbon and your scissors. Cut your yard in half. This step is optional, as I chose to work with a wired ribbon because I liked the color. I don't want the wire in my final product, so I am going to pull it out. Do this by taking the wire in one hand, the ribbon in the other, and gently pull. Move the ribbon down as you pull the wire out. Fold the ribbon over itself, accordion-style. For this particular bow, I am working with 5″ folds. You can choose your own size, but I found this length works well for the width of the ribbon I chose. Once you have folded your ribbon over itself, take the other half of your ribbon and put it underneath it. Bring the other ribbon around the folded ribbon and tie a basic overhand knot. Pull it tight. Bring out the folded pieces of the ribbon. Open them up, space them out, and work with them until you are happy with your final shape. Clip the tail of your bow so it has a nice and sharp angled edge. This creates a polished look and prevents the ribbon from fraying. Now you have a basic layered bow with a tail. This technique is often used in holiday decor. This is a very easy way to get a beautiful flower-shaped bow. You will need wire ribbon for this bow technique. You will need about 1 yard of ribbon and your scissors. To create your flower shape, you will only want one of your sides of ribbon to have a wire in it. Pull the wire out of one, and only one, of the sides. Do this by taking the wire in one hand, the ribbon in the other, and gently pulling. Move the ribbon down as you pull the wire out. Set the wire aside, you can recycle it later. Take the wire that is still inside of your ribbon and tie it in a knot at the base. To tie a knot with this thin wire, all you have to do is wrap it around itself several times. Now to create your flower-shaped bow, you will need to bunch up your ribbon. Do this by holding the wire taut in one hand, and bring the ribbon down with your other. The knot you tied at the end of our wire should hold the ribbon in place so it will remain bunched and not fall out the other end. After all the ribbon have been bunched at the bottom of your wire, work the ribbon in your hands so the wired side faces in, and work the ribbon around itself in a spiral shape. Your wire is now through the middle of the flower and on the same end as the knotted wire. Now poke the long end through the ribbon, catching a wired edge beneath it, and pull it tight. Do this twice and cut your wire. The flower will now be secured in place. This flower ribbon was probably the easiest of all to make, and you can use this technique to make bows for packages, floral arrangements, and Lord knows what else! Make your own boutonniere and corsages, floral wreaths, and more. You could make a whole bouquet of ribbon flowers in no time. If you still feel like you need some help making these beautiful bows, here's a great bow making kit that my mom likes to use for all her Christmas gifts! Learning how to tie a bow is fun and easy. You can make use of this skill in gift-wrapping, crafts, and whatnot. Now you can impress your loved ones with beautiful customized gift packages. Do you have other tips on how to tie a bow? Let us know in the comments section below! Editor’s Note: This post was originally published on May 14, 2014, and has been updated for quality and relevancy. This is a great post here loving article good color your site i enjoy this blog. Thank you so much for this tutorial. I’m like Marie B., I have tried to learn how to tie bows for years. But, until now I didn’t get it. Now I do, thanks to you! !